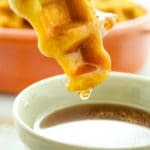 This recipe for pumpkin spice waffle dippers can feed a crowd! Just a few simple ingredients and 15 minutes bring it all together. Melt coconut oil and allow to cool to room temperature. Set aside for later. After 5 minutes have passed, add melted coconut oil, pumpkin, maple syrup, and vanilla. Stir to combine. Pour wet ingredients into the bowl of dry ingredients and mix thoroughly until smooth. Preheat the waffle iron and coat with nonstick cooking spray. Scoop the waffle mixture onto the iron in thin strips (we’re trying to create dippers, here!). Cook for 3 minutes. This recipe makes between 20 and 24 small, rectangular waffle dippers. We scooped about 3 tablespoons per dipper. To make this recipe as “regular” (non-pumpkin) waffles, swap applesauce for pumpkin.